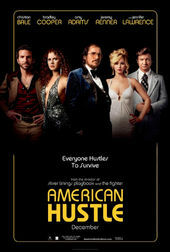 The opening sequence of David O. Russell’s American Hustle is all about style, polish, and hair. The film instantly places itself in the late ’70s by using the Columbia Pictures logo that was in use from 1976 to 1980 as well as era-appropriate stylizations for Atlas Entertainment and Annapurna Pictures. The smooth opening bars of Duke Ellington’s “Jeep’s Blues” lend their magic and a dubious title card claims, “Some of this actually happened.” Next, more than a minute of screen time is given over to Irving Rosenfeld (Christian Bale) and his complex combover: teased, stuffed, glued, and sprayed into place in a suite at the Plaza. The focus on the routine is unwavering, calling to mind the even more extensive scene in American Psycho in which Patrick Bateman (again played by Bale) details his grooming and fitness regimen. What American Hustle lacks in script and editing, it makes up for in locks. And the opening moments are all about the hair. Kathrine Gordon, the production’s lead hairstylist, had the idea for a coiffure-centered scene and Director David O. Russell liked it so much he decided to incorporate it. Bale and Gordon rehearsed the scene for two days before it was ready to shoot. By placing this scene at the fore, just as in Mary Harron’s American Psycho, Russell tells the audience two things: this is a character-driven film, and appearances take the cake. Immediately after this moment, viewers are dropped into a squabble and a scam. Irving, Sydney (Amy Adams), and Richie (Bradley Cooper) bicker and lay blame – much of the dialogue improvised by the actors – before heading down the hall. The pace slows into a sleek strut and Steely Dan’s “Dirty Work” streams in, a warm song that both underlines the characters’ actions and infuses the scene with weight. As the title card comes up, set in ITC Bauhaus Medium and a golden hue, Sydney opens the double doors, flanked by Richie and Irving. Despite everything that’s passed, they present a united front. The show must go on.